The newly opened Quest Epping offers apartments from studio size up to three bedrooms. 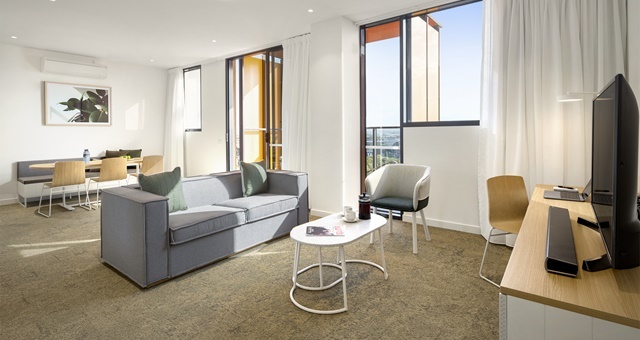 Quest Apartment Hotels has opened its newest property in the Melbourne suburb of Epping, with the new complex located within the Pacific Epping Shopping Centre complex. AFL icon Kevin Sheedy AM joined with Whittlesea Mayor Cr Lawrie Cox and Quest CFO Jason Vanderzalm to cut the ceremonial ribbon at the new property, which is in line to benefit from a projected 71 per cent population rise over the next quarter century as new industries continue to open in the area. Quest Epping features a modest 96 apartments ranging from studio, one, two and three-bedroom varieties. Each offers a fully equipped kitchen and laundry, while guest facilities include a business lounge, meeting rooms and fitness centre. Franchisees Daniel & Jennifer Wilson and Mark & Ky O’Shea said the property had been busy right from its soft opening a few months back and they were glad to see this grow following its official launch. “The past few months since we opened have been extremely busy and we couldn’t have done it without the support of our wonderful staff and the local community. We are looking forward to building upon the foundation we have set in 2019 and beyond,” Jennifer Wilson commented. Quest Apartment Hotels currently has plans to open 11 new properties in the next two years across a host of regional centres including Orange, Joondalup and the South Perth foreshore.